A renowned Korean choreographer, Lee Jeong-Yun was the principal dancer and choreographer at the National Dance Troupe of Korea from 2002 to 2014. He holds a PhD in Traditional Dance Studies from Hanyang University, an MFA from Korea National University of Arts and a bachelor degree in dance from Sungkyunkwan University. He was appointed the artistic director of Motion Plant Dance Company (MPDC) in 2011 and has been working with the dance company ever since. He is also the director of the Lee Jeong-Yun Dance Company, and is currently a visiting professor at the Department of Dance, Taipei National University of the Arts. Lee’s work shows a vivid ethnic style, and he also specializes in Korean contemporary ballet. Not only does his work overflow with the beauty of traditional Korean dance, it is also enriched with the expressive physical language of contemporary dance style. When choreographing, Lee often ingeniously blends modern dance into traditional Korean dance, reinventing the cultural legacy of his native land. In recent years, he has created numerous solo and duet dance pieces as well as group dances, such as his Ganggangsullae. It’s a Korean traditional dance piece involving more than ten performers and blended tradition and contemporary together. 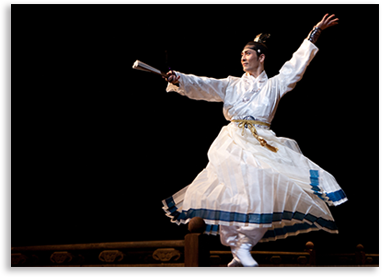 In his work, audiences can appreciate the spirit and essence of delicate Korean traditional dance while being immersed in the powerful dynamics of contemporary dance. Lee was awarded the First Prize of Korea’s Dong A Dance Competition in 2000, and was awarded The Artist of the Year by the Korean Ministry of Culture, Sports and Tourism. In 2015, He was selected as the representative choreographer for the International Young Choreography Project hosted by the World Dance Alliance in Korea, and participated in the international choreography project for the 2015 International Dance Day. He was appointed choreography director for the closing ceremony and performance of the 2018 Pyeongchang Winter Olympics. For the past three years, Lee has created twenty-two outstanding dance pieces, respectively performed in Korea and various places around the world.